So your boyfriend's growing a beard? Mine too. You either love it, or you hate it (I blooming love Joe's) but the ever growing question he keeps asking me is what products should he be using on it and how the heck does he keep it tame? First things first, you gotta keep that beard clean. I got him the Brisk Unfragranced Beard Shampoo, £4.99. I chose the unfragranced scent mostly because the other one from the range had tea tree in and I'm allergic, but thought too much scent here could be not pleasant. This shampoo has been created specifically for beards, it's paraben and sulphate free and leaves the hair clean, soft and easy to tame. Plus - it's budget friendly, so you don't have to feel too bad if he doesn't use it, or if he loves it so much he has to repurchase. When Joe started growing his beard, this was an essential. We looked and looked for a beard brush but couldn't actually find one anywhere in store (any recommendations, let me know?!) but in the end, ended up using a Tangle Teezer Men's Compact Brush, £12.49 that we already had. It's compact so not too big for the beard and combs through the hair easily. Pick up a pair of hair scissors while you're at it to keep it nice and trimmed back too. I got Joe a couple of options for beard hydration, a balm and an oil. They can both be used together, but this can be a little on the heavy side so one or the other is usually fine. The Brisk Beard Balm, £5.45 is used by rubbing the product between the hands to become more of a liquid texture before applying to the beard. It hydrates (also hydrating the skin underneath!) but also has the added benefit of keeping the beard in place which is why I think it's Joe's current favourite. Another option if you're looking for an oil is the Brisk Citrus Beard Oil, £6.99. I adore the scent of this and it works to make the skin less itchy from the beard. It also dries in quickly which is a bonus in the oil department! Now this has to be the biggest bane of my life with what comes alongside the beard. The trimmed hairs EVERYWHERE. If you've been through this, if your boyfriend has a beard then you know what I'm talking about. I'm not quite sure how I found this, but in my opinion it's the greatest invention ever (and Joe, if you're reading this, pleeeeeease use it more ;)!). If you have this problem, you need to buy a beard bib, £2.99. It essentially attaches to your boyfriend and the mirror and catches all the hairs in between - and for £2.99, happy days! 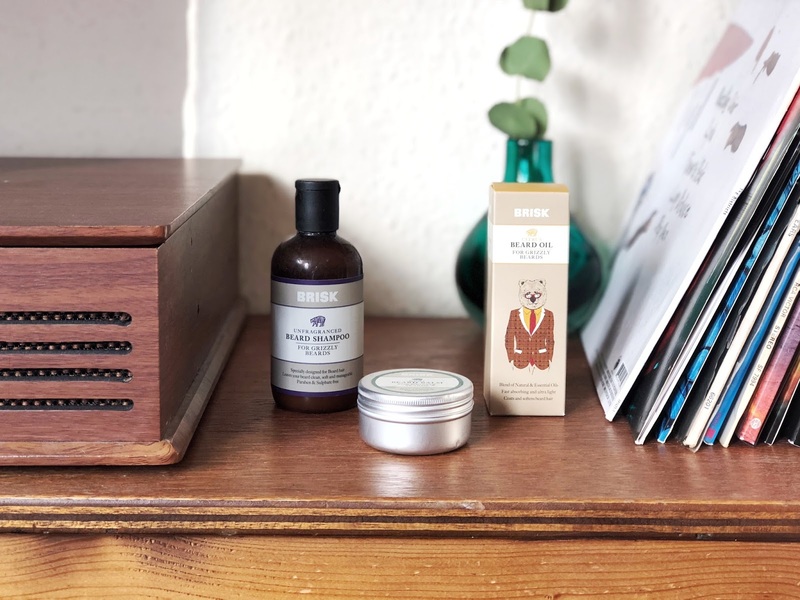 I got a few budget friendly beard essentials here, but now the beard is here to stay it would be great to get recommendations on what beard products your boyf uses. Let me know!